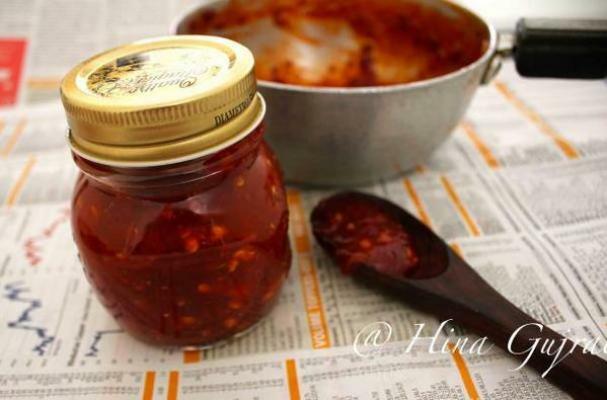 Make your own Thai chili sauce using red chilies, vinegar, plenty of garlic and a hint of sweetness. Thin with water or soy sauce to make a sweet and spicy dipping sauce for spring rolls or an Asian chicken recipe. Boil 3/4 Cup water in a pan. Take dry chillies in a bowl. Cover it with boiling water and let it soak for 10 minutes. Now take soaked chillies in a blender along with water. Add in sugar, garlic, salt and vinegar in this. Blend it to a puree. Pour this in a saucepan and bring it to a boil. Boil this for 10 minutes on a low heat so that the flavors will infuse together. Now mix cornflour with 2 tbsp of water. Pour this over the sauce and mix well. It will start thickening. Bring to boil once or twice. Switch off the flame and let it cool completely. Store this in a dry, airtight, glass jar in fridge.